Cub Cadet’s lineup of utility vehicles continues to expand with the launch of the Challenger 400. Designed to tackle a variety of jobs in the field, the Challenger 400 packs heavy-duty features and dynamic styling into a compact utility vehicle. Powered by a 404cc Subaru engine, it can reach speeds up to 25 mph and tow up to 500 pounds. The 27-inch by 37-inch 350-pound bed capacity provides the power and versatility to haul firewood, tools and camping/hunting equipment. The bed also provides a dump bed feature for easy unloading. Measuring just 50 inches wide, the Challenger 400 fits in the bed of standard pickup trucks and is narrow enough to traverse ATV trails where other utility vehicles are too wide to go. Heavy-duty coil-over shocks on all four wheels help ensure better on- and off-road comfort and handling. The Challenger 400 is the latest in a strong new line of UTVs from Cub Cadet. Launched last year, the Challenger Series includes the Challenger 500, the Challenger 700 and the Challenger 750 Crew, offering a range of options. 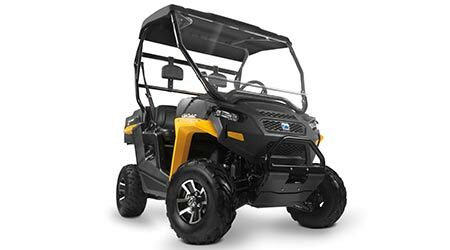 Backed by the strength of Cub Cadet’s dealer network, the Challenger Series UVs provide power, performance, versatility and valuable standard features.